Ephraim Minerd -- also spelled Minard, Miner and Minor -- was born at Hexebarger near Kingwood, Somerset County, PA, on July 1, 1838, the son of Henry and Mary "Polly" (Younkin) Minerd. He is believed to have been named for his mother's brother, Ephraim Younkin (1818-1889). Our Ephraim was a disabled Civil War veteran, and was twice married -- both of his wives also were his cousins, Joanna Younkin and Rosetta Harbaugh (shown here). He and his wartime writings are the subject of a 2011 book, edited and published by the founder of this website -- Well At This Time: The Civil War Diaries of Ephraim Miner. The book has been featured in a full-page article in the Pittsburgh Post-Gazette, and reviewed in the magazines America's Civil War and Western Pennsylvania History. Ephraim's initial diary book may have been a gift of the famed poet Walt Whitman, who was a male nurse in the same Washington, D.C. hospital and and at the very same time Ephraim was there, and who was in the habit of giving writing materials and diary blanks to convalescing soldiers. Ephraim was part of a truly immense family of more than 100 first cousins. On his father's side of the family, he had 51 first cousins, and on his mother's side he had 52. When a young boy or teenager, Ephraim witnessed a triple tragedy, but miraculously may have helped to save his mother's life. She suffered from epilepsy and while having a seizure fell headlong into a burning fireplace, burning off her ear and hair, and killing the baby she was holding. In one version of the story, Ephraim somehow had enough presence of mind to race to his mother's aid and pull her out of the fire, saving her life. He later gave credit to God for giving him the strength. In another version, the grandmother pulled Polly out of the fire, but died of fright after seeing the extent of her horrific injuries. In 1859-1860, in Ephraim's "young manhood...[he] gave his heart to Jesus Christ, and united with the Church of God at Old Bethel, in Upper Turkeyfoot," said the Somerset County Leader. Old Bethel was the first Church of God planted in Somerset County, PA, and he is acknowledged in a history of the congregation as "an active member..."
When the federal census was taken in 1860, Ephraim was boarding in the home of farmers John and Elisabeth Dumbolt (Dumbauld) near Kingwood. 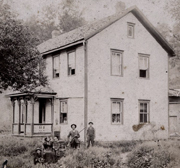 They were near neighbors to Ephraim's uncle and aunt, Andrew and Susan (Younkin) Schrock, and Ephraim's 68-year-old widowed grandfather, Yankee John Younkin, who resided with the Schrocks. At age 24, during the Civil War, Ephraim enlisted Company D of the 142nd PA Volunteer Infantry on Aug. 1, 1862. He served together in the same regiment with his first cousin Martin Miner, with whom he was close he considered a "brother," and with cousin-in-law Andrew Jackson Rose Sr. He was so hungry that, he later said, "If I had seen a piece of meat lying in the mud I would have eaten it." Ephraim endured frostbitten feet and was deafened by cannonfire. On Jan. 18, 1863, he left the regiment for medical treatment, and remained hospitalized for many months. The sketch seen here, entitled "Wounded Soldier," depicts a scene that Ephraim likely may have experienced during his slow recovery. In July 1863, he was treated for "lame back and leges" at a hospital in West Philadelphia on the days that his regiment saw action at Gettysburg. Later he was sent to Camp Convalescent, Alexandria, VA. In October 1864, he was transferred to the 22nd Regiment, Veterans Reserve Corps, where he spent the remainder of the war. Ephraim kept diaries in 1864 and 1865, usually consisting of one to two sentences per day. (Some sample entries: "I am very lonesome to day. I am all ways lonesom on Sundays." ... "I would like to be in old turkeyfoot today." ... "April 15, 1865 - there is very bad news. old president lincoln is kild. it is to bad.") He was discharged on July 1, 1865 at Camp Dennison, OH. The diaries are reproduced in full in Well At This Time. Contemporary sketch of Camp Convalescent in Alexandria, where Ephraim was stationed for part of his long recovery from wartime injuries. The Miners produced two sons -- William "Lincoln" Miner and Freeman "Grant" Miner. Both boys were born with mental disabilities, perhaps victims of three straight generations of intermingling of Minerd and Younkin DNA. Younkin Cemetery at Paddytown where Joanna Miner is buried along with her parents and sons. Sadly, wife Joanna died in 1875, at the young age of 28 years, 10 months and 28 days. Her passing left behind a grieving widower and their two young sons. She was laid to rest in the Younkin Cemetery in nearby Paddytown. Her upright grave marker (seen here in 1978), has faded badly over the years. On the stone, her husband's name is misspelled as "Ephrian Minard." As a widower, Ephraim must have searched for more lucrative work to generate a larger income stream for himself and his two young sons. Perhaps encouraged by his father-in-law Harmon Younkin, who would go on to serve as postmaster for Turkeyfoot circa 1883-1884, Ephraim decided to pursue opportunities the U.S. Postal Service. In March 1876, he submitted two bids to carry mail "from Shaff's Bridge to Kingwood, 8¾ miles and back, three times a week." Among his rival bidders were Younkin cousins Garrison N. Smith and Freeman Younkin. He was the runner-up bidder at $175, but Freeman Younkin won the work with a slightly lower bid of $173.00. The list of bidders was duly published in the Index to the Executive Documents of the House of Representatives for the second session of the 44th Congress, 1876-1877. Dabbling a bit in politics in the mid-1880s, Ephraim was elected as an inspector of Upper Turkeyfoot Township in February 1884, along with P.P. Reiman. Three years later, in February 1887, he again was elected an inspector of the township, along with his kinsman W.D. Younkin, with another cousin, F. Younkin, serving as constable. ... his life was spent in the community where he died, and so the life of Herman Younkin is an integral part of the history of the county itself. He was an acceptable member of the Methodist church for nearly fifty years, and a local preacher for over thirty years, and once a year all along these years the question was asked in the quarterly conference, "Anything against Herman Younkin?" And the response was, nothing against him. This testimony to the life and integrity of the deceased is valuable and a source of comfort to the family. For nearly fifty years a member of the church, and a good part of that time a minister of the gospel in the midst of the people with whom he spent his whole life, comes the response, "Nothing against him." And as he passed from human recognition into the presence of the Universal Father, he has received the divine approval of "Well done good and faithful servant, enter thou into the joy of the Lord." After spending two years alone, Ephraim married his second cousin Rosetta Harbaugh (1859-1953) on March 27, 1877. She was the daughter of David and Mary [Whipkey] Harbaugh of nearby Scullton, Somerset County. Witnesses to the ceremony included Ephraim Schrock and Daniel Dumbauld. The service was performed by Elder John Hickernell, a longtime friend of the family who had performed the marriage of one of Ephraim's aunts some 28 years before. Hickernell and Rev. John Winebrenner were pioneers in the founding of the Church of God in the eastern United States, including the Old Bethel Church of God in Hexebarger of which Ephraim was a lifetime member. Ephraim and Rosetta would have known each other intimately through their intermingled family connections over the years, although there was a 21-year difference between the ages of the groom and bride. 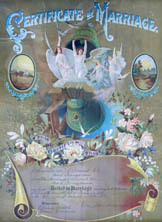 Their fancily decorated certificate of marriage, providing details of their wedding ceremony, and has lovingly been preserved today by a great-great granddaughter. The Miners went on to have three children of their own -- John Andrew Miner, Harry David Miner and Minnie Edna Gary. 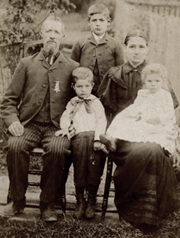 The family is shown here, with Ephraim and Rosetta and their young children -- John (standing, rear), Harry (standing, front) and Minnie (seated on Rosetta's lap). Rosetta sent this photograph to her relatives, including her sister Letitia (Harbaugh) Stoner, who lived in West Virginia at the time. Very religious, Ephraim didn't allow work to be done on the farm on Sundays. He is known to have said grace before every meal, reciting the words, "From everlasting unto everlasting..."
In 1889, his namesake uncle Ephraim Younkin, who had migrated to Illinois in the 1840s, passed away at the age of 71 in DeSoto, Jackson County, IL. The Miners built a new home in Hexebarger about 1896, on 107 acres of land his grandfather Yankee John Younkin had once owned and had been inherited by an uncle and aunt, Andrew and Susanna (Younkin) Schrock. The tract had been sold in 1887 by Ephraim's cousin Perry Schrock to cousins (and Ephraim's uncle and aunt by his first marriage) Samuel and Ann M. (Younkin) Phillippi. The Phillippis in turn held the acreage for three years before selling it to Ephraim for $1,003.50. The farm bordered the properties of Ephraim's cousin Ephraim Schrock and the Williams family and included stands of white oak and dogwood. The family posed for a photograph in front of the two story, frame structure. Click here for a close-up view of this image, which appeared as our "Photo of the Month" in June 2000. In October 1905, Ephraim's 65-year-old cousin Martin Miner and his wife Amanda of Normalville spent an enjoyable weekend visiting with relatives at Kingwood, likely Ephraim and Rosetta. While there, Martin visited his birthplace at Hexebarger but after returning home told a newspaper reporter that the "old ear marks of boyhood days are about all obliterated." Sometime in the early 1900s, brother Andrew and his wife Mary Louse traveled from their home in Washington, Washington County, PA for a visit. They laughed and joked and had a marvelous time together. The two couples had a photograph portrait taken together, although despite the frivolity they all look rather serious in the image. Ephraim was a member of Grand Army of the Republic Post 210 at Somerset and enjoyed attending reunions of the 142nd Pennsylvania, including ones at Connellsville, Fayette County, PA in 1893 and in Somerset County in 1896 and 1912. The 1896 event was held at the Somerset Opera House, said the Somerset Herald, and "at the command 'fall in !' there was a wild rush on the part of the 'boys' to head the column, which resulted in comrades William Huston, William M. Hochstetler, Jacob Heinbaugh and Jonas M. Cook, all sufferers from dyspepsia since the days when their daily fare consisted of bean soup, hard tack and mess port, with an occasional confiscated 'Johnny cake,' reaching the coveted places. They were closely followed by comrades Amos Knepper, A.C. Davis, Ephraim Minor and 'Zach' Snyder, who seemed determined to have a place at the table no matter whether the fare consisted of hard tack or jelly cake... "
We are researching whether he went to Gettysburg in 1889 with fellow veterans for the dedication of the monument honoring the 142nd Pennsylvania Volunteer Infantry. He is known to have visited Gettysburg in July 1913 for the 50th anniversary of the battle, traveling with cousins Jerome B. Jennings, Balaam Younkin, Silas Younkin and LeRoy Forquer and Jacob J. Rush (of the family of Frederick and Margaret "Peggy" [Faidley] Dull). Reported the Meyersdale Republic, "It has been a long time since there has been so great interest manifested in any coming event, as there has been during the last few weeks in the veteran's re-union at Gettysburg... more than a score of veterans from the Turkeyfoot region left here Monday forenoon. We can only imagine his emotional anguish at having missed the great battle for which his regiment was so well known and praised. In 1890, when a history of his regiment was published in the book War History, authored by Col. Horatio N. Warren, Ephraim was mentioned in a roster of soldiers. Also listed were his cousins Martin Miner, Andrew Jackson Rose Sr., John S. Trimpey and Jacob Phillippi. Ephraim was in the news in August 1898 when his Civil War discharge papers were found by the Somerset County Recorder of Deeds while indexing old records. Of special interest were the handwritten words of endorsement -- "This man was a good soldier." The story was reported in the Somerset Herald, which went so far to say that "Many of the present generation are ignorant of the fact that the discharge papers of hundreds of volunteer soldiers are masters of public record. Mr. Minor's, however, is the only one so far discovered bearing the endorsement mentioned above, but it goes without saying that they were all good." Ephraim and Rosetta, in company with his sister Nancy Farabee and brother Andrew Jackson Miner, attended the first Minerd Reunion held in August 1913 at Ohiopyle, Fayette County. In 1916, he also attended the reunion, prompting the Meyersdale Republic to report: Ephraim Miner of Upper Turkeyfoot Townshipo, a veteran of the Civil War who is over 80 years of age, was visiting his old army comrade, Dr. W.S. Mountain last week. He left Saturday for Ohiopyle to attend the reunion of the Miner family who are scattered over the counties of Somerset, Westmoreland and Fayette." In August 1920, he took his grandson Norman Clark Gary to the Minerd Reunion held at Ferncliff Hotel in Ohiopyle. In 1917, at the outbreak of World War I, the 79-year-old Ephraim remarked that he wished he could enlist and serve his country again in military service. Circa 1910: Ephraim and Rosetta (front), and, L-R: Harry, Minnie, Linc and Grant, in front of their home. 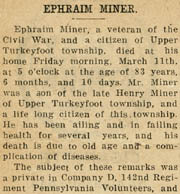 Ephraim passed away at home on March 11, 1921, at the age of 83. At his insistence, there were no flowers but rather flags at his funeral. Members of his Civil War Post were unable to attend "by the almost impassible condition of the roads." He was buried at the Kingwood IOOF Cemetery, in his Army uniform, with its buttons polished brightly. Obituaries were published in various local newspapers, including the Somerset Herald and Somerset County Leader. Rosetta outlived her husband by more than three decades. In August 1924, she and her sons John and Harry and their families attended the Minerd-Miner reunion at Lincoln's grove, near the Western Maryland Railroad Station in Confluence. They were among the 82 individuals in the crowd. In an article about the reunion, the Meyersdale Republican newspaper spelled the family name as "Minard" but reported the following: "A very successful and pleasant reunion of the Minard family was held in what is known locally as Lincoln's grove, near the Western Maryland Railroad Station.... The family is a numerous one in Western Pennsylvania, especially in Fayette, Somerset, Westmoreland and Huntingdon Counties. The gathering on Saturday was their twelfth annual reunion." She resided in her later years with her children, in Connellsville, Scullton and Hexie. In the mid-1940s, she lived with her son Harry in Connellsville. She was featured in a newspaper article for her “fine head of hair” which measured 32 inches in length. In the fall of 1942, Rosetta is known to have traveled to Illinois to visit her sister, Letitia (Harbaugh) Stoner, who had suffered a stroke. She returned home safely on Oct. 17, as noted in the diary of son Harry. Rosetta enjoyed the annual Harbaugh Reunions. She is known to have attended the first annual event in 1926, when her mother celebrated her 94th birthday at the old Harbaugh homestead. She is recorded to have received the "Oldest Woman Present" award various years from 1947 to 1951. On Sept. 23, 1953, at the age of 94, Rosetta passed away at the home of her son John in nearby Fayette County, PA. Her remains were brought to Kingwood to be placed at rest beside her husband, after a separation of more than three decades. Their grave is seen here, as photographed in 1978. Rosetta's passing was noted in the diary of her double-cousin Albert "Ward" Minerd, of nearby Mill Run, Fayette County. In his entry for Sept. 26, 1953, Ward wrote: "Rossette Harbaugh Miner was burried today." In October 1934, nearly six decades after the death of Ephraim's first wife Joanna, she was remembered and named in extensive genealogy manuscript records compiled by distant cousin Otto Roosevelt Younkin. He and Rosetta's nephew Charles Arthur Younkin were gathering data in connection with the Younkin clan's new national home-coming reunion. Click on the following links to see Otto's actual handwritten notes: first set and second set. Otto and Charles Younkin also researched Ephraim's Younkin heritage. Click here to see all of Charles Younkin's handwritten letters of Feb. 10, 1935, Feb. 17, 1935, Feb. 19, 1935 and Oct. 15, 1935, where he reports on the progress of his research into the tangle of interconnections between the Minerd, Harbaugh and Younkin clans. In 1986, Ephraim and Rosetta's grandchildren and great-grandchildren began holding reunions at the Kingwood IOOF Grove, the same place where the national Younkin home-coming reunions began in the 1930s. The 1986 reunion evolved over the years into what is now the national Minerd-Minard-Miner-Minor Reunion. After two decades at the Kingwood Grove, the reunion eventually was moved in 2006 to the Indian Creek Valley Community Center in nearby Indian Head, Fayette County. Ephraim's newspaper obituaries have been reprinted over the years. The Somerset County Leader piece was published in the book, Down the Road of Our Past in the 1990s, by the Rockwood Historical Society. The Somerset Herald obit appears in the November 2005 edition of the Laurel Messenger newsletter of the Historical and Genealogical Society of Somerset County. 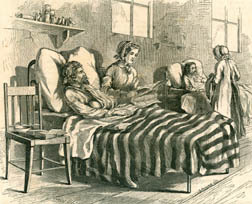 Wounded soldier sketch originally published in July 1862 edition of The Children At Home, a newspaper of the American Tract Society, Boston. Joanna (Younkin) Minard and Ephraim Miner grave photos by the late Odger Wayne Miner.